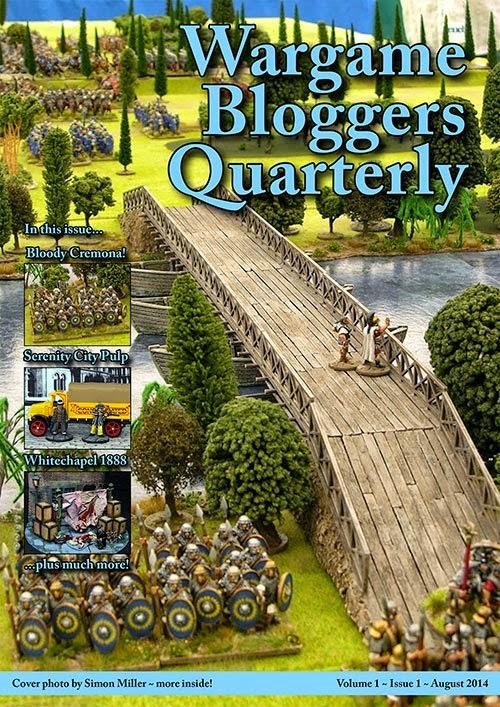 The Wargame Bloggers Quarterly (WBQ) is a FREE community driven electronic magazine (PDF e-Zine) composed of the best wargames and miniature painting content from the collective blogosphere. The purpose of the WBQ is to help promote wargaming and miniature painting and ensure that the best material generated by participants in the hobby is available to the wider community in the long term. Any individual is free to submit content to WBQ for publication. Submissions may not have been published in any other e-Zine, printed magazine or other publication to prevent copyright infringement (with the exception of the author’s own personal blog). All content remains the copyright of the author at all times and will be fully credited upon publication. If you want to know more about WBQ you can read our charter here or you can contact the current Editor-in-Chief via email on wargamebq@gmail.com. Important: WBQ is specially designed for tablet and/or PC viewing and contains high-resolution images and other content that look great when zoomed in or viewed full page. Make sure you download your copy rather than view it online to get the very best experience! It has been my absolute pleasure to have been involved in this project celebrating, as it does, all that I have come to love and enjoy about this most wholesome of hobbies and the hugely supportive community that encompasses it. I would encourage all to get involved by identifying possible content and contacting the Editor-in-Chief directly. Finally a huge congratulations should go to Michael 'Millsy' Mills who managed to galvanise a group of charming, but disparate Gentlemen into producing something we all hope will continue to flourish, well done Sir! What a wonderful idea! I already downloaded mine! Well done! Thank you Thanos, I'm delighted. Very very well done guys! Issue 2 is already in the planning stages, so more to come. It's a cracking idea and a very good publication. Nice one! Thank you Gary, we have certainly got something to work with. Brilliant idea. I'll think on something to submit. A huge team effort, masterminded superbly by Millsy. Its a great looking issue I commend Michael for getting it out. I have some knowledge about the trials of getting disparate gentlemen together on a project its much like cat herding. And as the person in charge of the Devil's Kitten I know a lot about that. Thank you Robert, Millsy managed to keep us all in check and we are certainly thrilled with the results. Fantastic idea Michael! Looking forward to a long prosperous endeavor with it. Thank you and let's hope so. What a great idea...Thanks for the heads up. Thank you for spreading the word, greatly appreciated. That was a fun read, thanks! Hopefully more to come Paul. That's great to hear Simon. I'm delighted you enjoyed it Captain, perhaps you might consider contributing; your tables have certainly inspired me and would make a great feature. Please do Dean, plenty of great ideas for all. I read the first issue and was gobsmacked. Very professional looking, with some great contributors. Well done to you boys! Thank you Anne, huge credit to Millsy and the team for getting it out, perhaps we can persuade you to contribute at some point? Thank you Christopher, a lot of people have worked hard on it. A good read. Well done by all. I'm delighted you liked it. Glad you enjoyed it J.D. Dear Peter, the joy of the publication is that it is online and of course doesn't worry about geographical restrictions or boundaries - so yes anyone can submit work. Just looking at some of what you have described they sound perfect and I would encourage you to contact the Editor-in-chief using the email address above. The idea is that the editor will change with each issue and is currently Dave Docherty, who has the blog 'One man and his brushes'. Best of luck and I hope to be reading some of your articles soon. Many thanks for the hint, Michael. I'm very much looking forward to reading your article about this excellent Whitechappel scene of yours. I think this will really take off. What impressed me was the benefit of the improvement in graphic design from a blog. Made it much more readable. WBQ was a great read and I enjoyed seeing even higher resolution photos of your Whitechapel piece. Fantastic idea ... if only I had something useful to contribute. I will definitely be checking the first issue out.